First seen in an animated TV series in 1987, Leonardo, Michelangelo, Donatello and Raphael were back in 2012 with a stunning new series on Nickelodeon channel. Updated TMNT toys support the latest incarnation of these famous characters who have featured in various TV shows, films and video games over a twenty five year period. Toys made by Playmates are distributed in Europe by The Giochi Preziosi Group, of whom Flair is the UK arm. As well as featuring the four heroes, action figures of Splinter the Japanese mutant rat and Shredder the Turtle’s evil enemy and ninjutsu expert also feature in the line-up. New characters such as Dogpound, Fishface and Metalhead add extra excitement to the ranges. 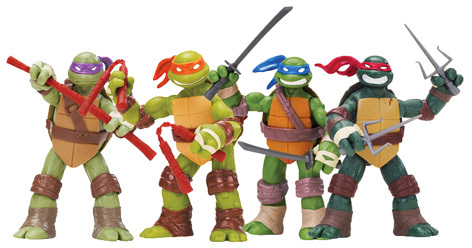 Standing 5.5 inches tall, Power Sound FX figures really bring the Teenage Mutant Ninja Turtles characters to life. Hear Leonardo shout out "Hiiiiiiii-yaa!" or "No Mercy!" when the coil is activated in his arms or legs. Evil Shredder responds with "You’re Mine!" A top of the range Shellraiser vehicle is an awesome piece of kit. Large enough to accommodate all four Turtles, it also includes a roof mounted cannon and a side opening door that sends Turtles flying out ready for action! Kids are also sure to want their own Ninja Stealth Bike, Dragon Chopper or Rippin’ Rider. 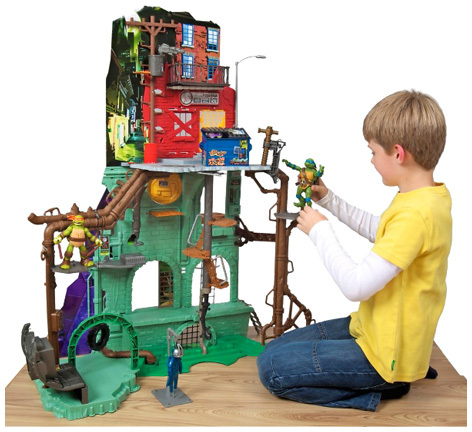 For ultimate Turtles sewer fun, kids will be blown away by the hugely impressive Turtles Secret Sewer Playset. At over a metre tall and containing over twenty different Ninja features, this toy will keep a family of kids entertained for hours. Such is the popularity of these endearing and enduring characters that plenty of other companies have piled in for a slice of the action. LEGO agreed to create Turtles minifigures that are joined by a series of playsets featuring the Shellraiser van as well as other vehicles and characters. Sambro make Turtles bikes, scooters and skateboards, together with games plus arts & crafts sets. Meanwhile Worlds Apart created bedroom furnishing and outdoor toys based on this famous quartet of Leonardo, Michelangelo, Donatello and Raphael. The Mutations range of Turtles really caught kid's imaginations with their interchangeable heads, arms and legs! Now almost any combination of unique Turtle can be created from a variety of different parts. Mutations Deluxe Figures can change from a Ninja Turtle into a Pet Turtle in a matter of seconds and these awesome characters are also accompanied by some Mutations playsets for even more fun.